Can Oscar Winning Films Generate Blockbuster Attention? Up until the last decade, the Oscars had always had a reputation for often eschewing mainstream success in favour of more acclaimed but lesser seen films. In 2009, this attitude was changed when the Academy introduced a significantly expanded Best Picture category to try to incorporate more popular fare. In 2017, though, the Best Picture nominations had the lowest average gross since the category was expanded with none of the films being present in the top 15 highest grossing pictures for the first time in 11 years. It would seem that this year, at least, the divide had returned between the films that generate the most revenue in Hollywood and those that generate the most respect. It isn’t just in box office grosses and industry recognition that differentiates this year’s Oscar contenders from the most successful blockbusters of 2016, they are also released and marketed in very different manners. 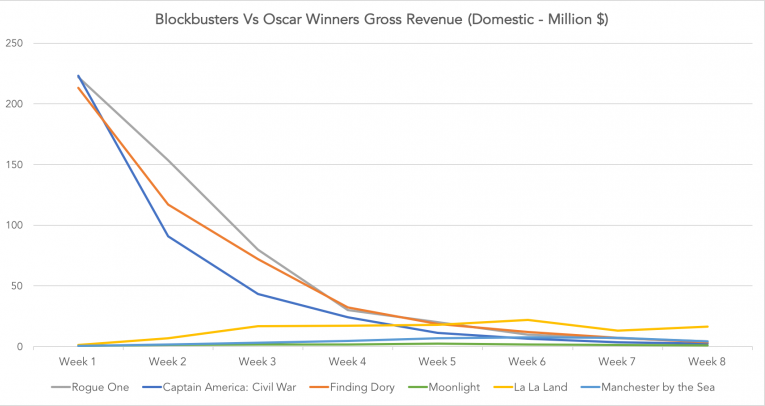 For the blockbusters, they almost exclusively focus on the opening week when they have the widest number of screens and their $100 million plus marketing campaigns have reached their peak to generate as much revenue as possible in seven days. After the first week, it is a sharp, steady decline in takings on a week by week basis. This is quite different, though, for the Oscar contenders. In the US, they begin their releases in a tiny handful of cinemas (around 5 screens) to generate buzz via a huge screen average, which often grabs the attention of the industry press (Moonlight enjoyed last year’s highest screen average of $143,000). They are then gradually released nationwide to more screens to allow the conversation and (hopefully) positive word of mouth to grow. This often means these films generally experience their peak in weekly revenue during their 5th or 6th week. It is very much a slow burn approach compared to the smash & grab strategy of a blockbuster’s release and is also achieved at a fraction of the marketing costs as they allow the audience to spread awareness of the product. For films that use the latter release pattern, the Oscars are the endgame to such an extent that as much can be spent on campaigning a film’s merits to Academy voters as it is for the film’s promotion to audiences. 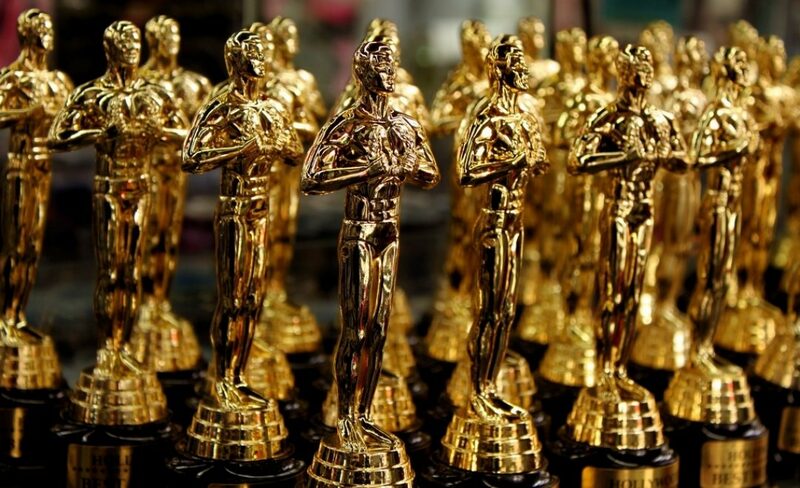 For sure, it is a gamble as only 2 or 3 films will hit the headlines the morning after the ceremony, but how valuable is gaining Oscar recognition? In terms of attention share, it’s almost priceless. So, despite the comparatively meagre budgets and grosses of this year’s Oscar contenders, two of them have stood toe-to-toe with the three highest grossing films of the last 12 months when it comes to getting audiences talking. That a certain name inside an envelope on just one night in the Dolby Theatre, Los Angeles can rival the attention gathered by hundreds of millions of dollars in marketing is the reason why the Academy Awards remains the most pivotal event in Hollywood to this day.